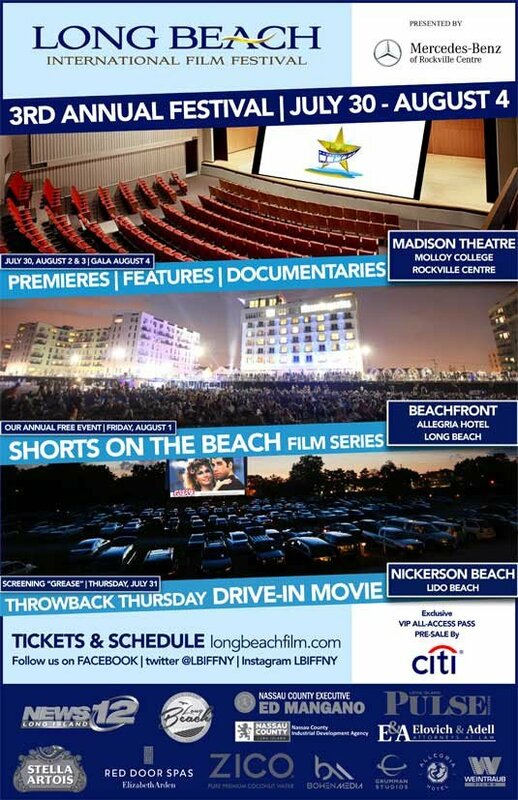 Long Beach, NY - July 1, 2014 - The full schedule of films and events has been announced for the 3rd Annual Long Beach International Film Festival (LBIFF), happening at locations in the City of Long Beach and Rockville Centre, Long Island NY from July 30 - August 4, 2014. Tickets are on sale now. Come watch the latest and greatest hand-picked independent movie releases from around the world and take part in exclusive film and music events, Q & A panels with award winning filmmakers and directors and much more. Do you have dreams of winning an Academy Award? Learn the tips, tricks and secrets of the trade at the #LBIFFNY invitation only filmmakers workshop hosted by the NYS Governors Film Office at Grumman Movie Studios, 500 Grumman Rd West in Bethpage, Long Island NY on Wednesday July 30th. Among the highlights of the festival is the world premiere of "Wisdom to Know The Difference" which was directed by Massapequa, Long Island NY's own Daniel Baldwin and stars his brother William Baldwin, Lou Diamond Phillips and others. This exciting screening will take place at Madison Theatre at Molloy College, 1000 Hempstead Ave. Rockville Centre, Long Island NY as part of our opening ceremonies on Wednesday July 30th and will feature an exclusive Q & A with Daniel Baldwin and his cast and crew after the film. "Having the Madison Theater involved this year is a wonderful addition to the festival, and especially exciting due to the fact the Long Beach Theatre is still closed due to Hurricane Sandy", said Craig Weintraub, Co-Founder of the LBIFF. Feeling nostalgic? Join them in Lido Beach, Long Island NY for their #TBT "Throwback Thursday Drive-In Movie Night" where they will be presenting the film classic "Grease" at Nickerson Beach, 880 Lido Blvd on Thursday July 31st. Gates open at 6pm. Then, on Friday August 1st come party in the sand at the Allegria Hotel, 80 West Broadway in Long Beach, Long Island NY and enjoy the beautiful atmosphere provided by the Long Beach Boardwalk and the Atlantic Ocean. Experience FREE short films and music side by side with celebrities and filmmakers on the red carpet during the "Shorts on the Beach" Film Series. Enjoy musical performances by former American Idol contestant Siobhan Magnus, one time Billy Joel collaborator Cass Dillon, Long Beach's own Ben Metzger and Joe Horowitz, the jamming reggae band Ruff Stuff and more as Jamaica Tourism creates a "Little Jamaica" on the beach for the festival goers. Features, shorts, documentaries and more will also be screening at the beautiful, newly renovated Madison Theatre at Molloy College in Rockville Centre on Saturday August 2nd and Sunday August 3rd. Additionally, their awards gala will also take place at Madison Theatre; where comedian Chris Monte (from Mall Cop 2 and other films) will perform selections from his Off-Broadway play, "Shut Up Sit Down and Eat", hosted by legendary long Island comedian Joey Kola, on Monday August 4th. Ingrid Dodd, Co-Founder of the Long Beach International Film Festival remarked, "Long Island has always supported the television and motion picture industry. It is amazing to see these successful production studios bringing projects such as the new Spider Man movie to our area, becoming proof positive that Long Island is a go to destination for filmmakers. In fact, in support of this, we are awarding a free day of filming on the Grumman stage to our Festival winner for Best Picture. Film is alive and well on Long Island". Last year’s Festival had a great outpouring of support from local celebrities in film, music and sports including Scott Franklin, Billy Crystal, Joan Jett, Dee Snider, Burt Young and UFC Champion Chris Weidman - and more of the same is confirmed and expected for this time around. With a VIP All Access #LBIFFNY Pass, you'll be front and center for all the action! For more info and tickets go to longbeachfilm.com. twitter @LBIFFNY / Instagram @LBIFFNY or like us on Facebook. Subject: LongIsland.com - Your Name sent you Article details of "2014 Long Beach International Film Festival: Full Schedule Announced"